Starling Aerospace has approval for all cabin interior products. Our Production organisation specialises in assisting other Design Organisations to assist and develop their product for cost effective build solutions for Interior products. Our extensive in-house capabilities and Services assist with all aspects of cabin manufacturing services including composite build 3 and 5 axis CNC routing, CNC machining of both ferrous and non-ferrous metals, soft furnishing manufacturing of aircraft seat foams, covers curtains, Tedlar and painting and flammability testing to efficiently approve materials for aircraft use in conjunction with our 21J Design Organization. 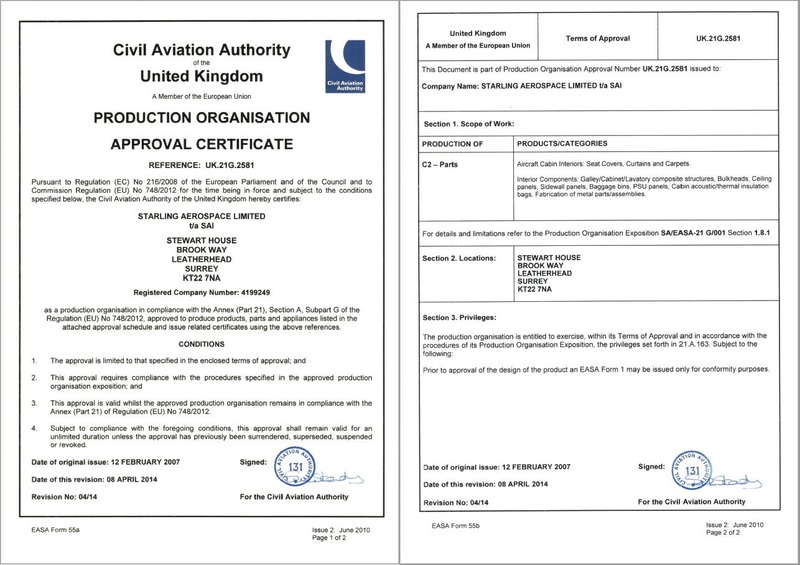 Specialized Seat Manufacture including in-house design and approval of divans and seating approved to both 9G and 16 G applications for large aircraft over 19 passengers. Our existing EASA approved seat frames can be modified to suit specific installations in both commercial and VIP installations.